We’ll be cheering as Ziconic makes his debut this Saturday, February 20! 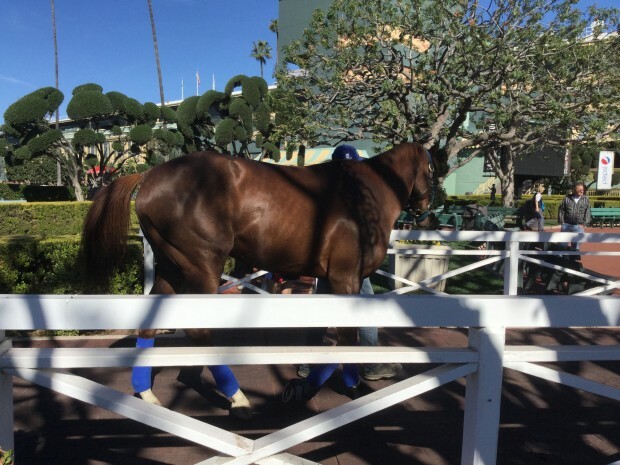 He is entered in Race 3 at Santa Anita, a seven-furlong maiden special weight. Post time is 1:30 PM PT, and he’ll start from post 5 with Gary Stevens aboard. Thanks Deb E. And he passed all of them with ease in the gallop out! Blessings to Gary for taking care of our prince and making his first race a good learning experience. Think a lot of other jocks would have been in panic mode that far behind and over reacted. Not Gary. He was great. He’s looked sideways at the stands as he came around the final turn and headed to the line. Danny used to do that too. I always loved that. Very impressive beginning. I can see him improving nicely with his next races. I think that we’ve got a winner with Ziconic. He might have been a little upset from the starting problem; they sort of rushed him in, when they saw he didn’t want to go in, even grabbed his ears, and I heard that hurts them. He has always been handled with love, that might have surprised him. He seemed like, he was wondering what was going on, but when he started to run, he was something to behold, just like mom!!! If the race was longer he would have won, because he was coming fast. Even Gary said Ziconic liked what he was doing, and he was happy to ride him, and he has ridden a lot of good horses. Ziconic also showed a lot of courage; seeing he was so far back, a lot of horses would give up, and throw in the towel, but not him, he went after them. John had a big smile when they came back. He is going to need a little longer race, and more gate training (with no ear pulling, because now he might be worse at the gate, expecting a fight). You did great Ziconic, everyone is proud of you!!! You did your mom proud!!!!!! Mr. Shieriff’s you have done a great job with Zenny’ s boys. I know all of you are proud how Ziconic ran today. Good luck in the future with these boys…. Good 3rd Zi. I hope they’re not training Zi to make the big surprise finish from last place to front place (don’t know the racing term). 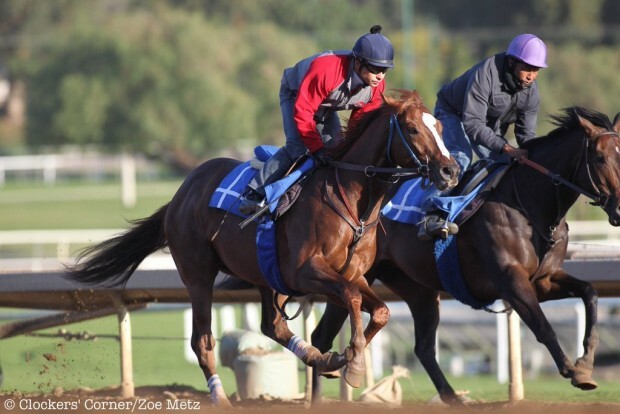 It’s scary, not exciting, and is what I think cost Zenyatta her last race to Blame. Anyway, what terrible coverage on TVG. They mispronounced names of both Ziconic and Zenyatta. Seems they were more focused on Gulf Stream. Had to watch Zi’s race on SPLIT SCREEN with GS which mainly showed front runners. Announcers had Ziconic losing before he even got to the gate. Said Coz was “a flop”. Said money bet on Ziconic was for “sentimental” reasons. Very negative announcers IMO. He looked every inch the son of Zenyatta …great job with this race, Ziconic. I am so excited for you! Congrats, Ziconic. You ran a beautiful race, you looked really sharp. Have a delicious dinner and sleep well. Keep up the good work! Luv ya! 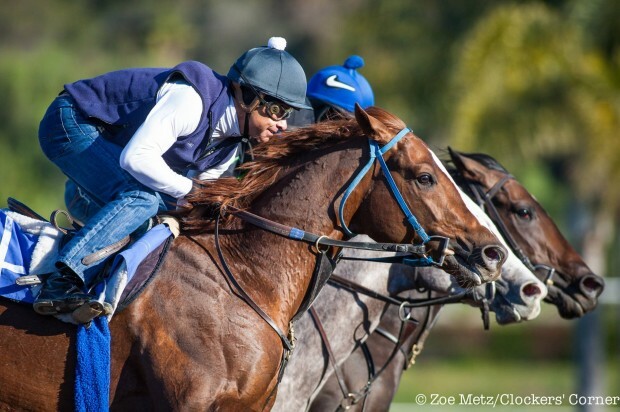 Good Race, Ziconic………..perhaps held back A little too long!! Third Place………in the Money$$$$$$ Keep up the good work! Ziconic You did Fantastic today. I can’t wait to show the children. I am so Proud of you. You looked like your mom running. I think you have her eyes. May God Bless and Protect you. Ziconic was awesome!!!!! What an exciting race it was!!! Congratulations Team Z! Zi really put on a show for us! I want to see Zenyatta’s last race. PLEASE.